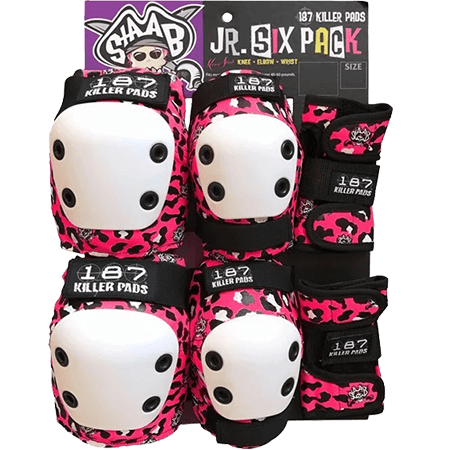 These are the 187Junior Six Pack Staab Signature Knee Elbow Wrist Pads now coming in Pink! Protect your little ones from broken bones, road rash or from getting scared after a bad crash with these Kevin Staab Signature Six Pack Pads. Get this Kids combo pads in spaced out blue and let them shred with out the risk of them getting hurt. This pack contains : Wrist guards Elbow and Knee pads but in kids size and cheaper. Same quality materials & craftsmanship as Pro Knee Pads. Designed for excellent flexibility & comfort. Constructed of ultra high strength ballistic nylon. Double stitching for durability. Super thick caps.